We Can Help With Used Oil Recycling! Since 1985 KRK Enterprises, Inc. has been providing grease and cooking oil recycling services for all of Florida. As your local, fully licensed service technicians, we are trained in safely collecting and transporting grease waste and used cooking oil from food servicing sites such as restaurants, statewide. Our clean storage containers offer a smooth and efficient collection service. Every food-servicing establishment has unique needs in terms of their grease and cooking oil use and disposal. When your business has small sinks or a large quantity of sinks, city inspectors require each restaurant to employ a safe and trusted grease-waste disposal program. This means using established professionals, like those at KRK, to collect your used cooking oil and grease for legal and safe recycling who can also provide manifest reports. These reports of KRK’s collection and haul-away of grease waste from your facility prevents your business from incurring large fines from your city inspector. 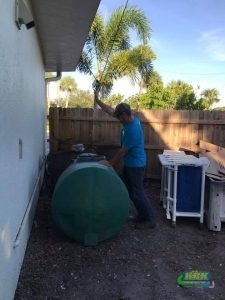 At KRK Enterprises, Inc. provides Fort Pierce and Port St. Lucie, Fl and the entire state with on-demand and regularly schedgrease/cookingoking oil recycling services. Our customers and their businesses matter a great deal to KRK. If you call us, our amicable office associates will happily answer your questions and assist you to the best of their ability. If you need immediate service, we have a full-time staff prepared to jump in and service your property. As your established servicing company with a foundation set in integrity and customer care, we can also provide a manifest report for verification of each servicing. 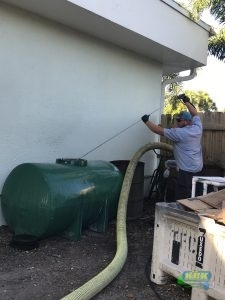 Overall, our cooking oil and grease waste disposal and service technicians are entirely licensed, insured, and fully trained. We work 24/7 to exceed your expectations with the quality and timely manner we carry each of our services. By fulfilling the recycling and safe grease waste disposal needs of your commercial food servicing business, at your convenience, our KRK technicians are satisfied in providing your peace of mind!